Out of Time: stills from video. This ongoing video project is, on the face of it, a far more straightforward proposition. 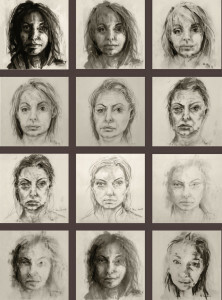 Out of Time (2005–) is a filmed narrative of a constantly slowly morphing series of self-portrait drawings of the artist’s face. Many are dated, and each slowly transforms into another image of the same face, but with dates that are rarely temporally sequential. Similarly, the image shifts subtly but radically in style and technique from each iteration to the next. Some are dark and brooding, some light and lyrical – some are near photorealistic, some more abstract. All of them inevitably, ineluctably, seem to invite the attribution of a state of mind. 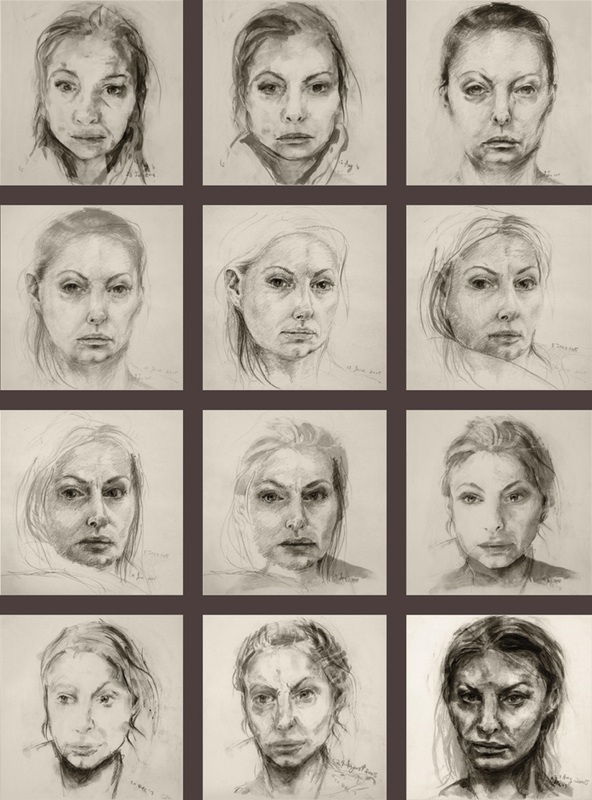 What was the artist thinking, and feeling, when this face became the face she saw and drew? But then each one slips away, replaced by another, which poses the same question, that must perforce have a different answer. It may be – for many reasons, not least its meditation on the one constant in her work, her own identity – her most important work. 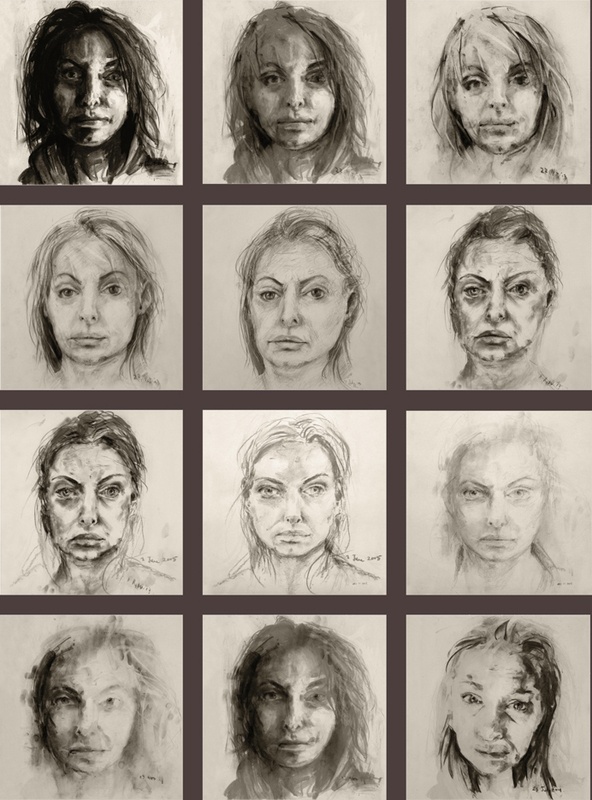 This search for meaning in a doubly removed representation of another human face (it is a video work comprised of a filmed and animated series of drawings) might be termed a biographical fallacy. 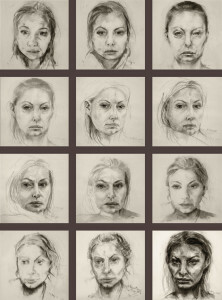 A ‘fallacy’ because at its heart is a simple human identification – a‘face to face’ moment, into which the viewer can pour a fantasy affect, a recognition of states of mind or represented emotions which the viewer can feel, but may not in fact exist, except in that biographical inscription, that identification. But Vári’s work is not that simple. Effectively, Out of Time works at three levels of representational complexity – the drawing, the photograph, the video animation. It acts almost as a commentary, at the level of the techniques and practices involved, of what we might call the technological history of the self-portrait. And yet this merely scratches the surface of the work’s extraordinary meditation on time, mortality and the sublime. Another matrix of meaning fits over this technological skein, one preoccupied with the mutable nature of time and the relationship of the Self represented in the portrait to the viewing Other. – Extracts from a catalogue essay on Out of Time, by James Sey. James Sey is an independent arts writer, critic, curator and Research Associate at the Faculty of Fine Art, Design and Architecture, University of Johannesburg.